HTR Z III with asymmetrical tread design enhanced by silica compound gives an excellent dry traction and steering control. It also has good wet grip but only second best to Dunlop in our wet track analysis. The tire is comfortable on bumps and has low road noise. Overall, ZIII is a top budget performance summer tire and really good choice for cars like Mustang, M3, and others. 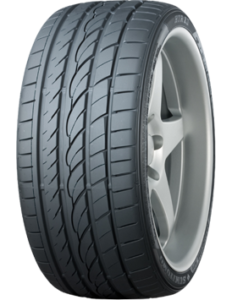 A more of a traditional tread pattern is used in Z III, which is certainly different from the V-shaped tread pattern Sumitomo used with the HTR Z II. And a lot of new tech is also introduced into the tread itself. ZIII has an asymmetrical tread design with large outside shoulder and 3 inner ribs enhanced by the silica compound. The combination of asymmetrical design with silica compound gives it good dry traction and high-speed cornering stability. Z3’s steering is quite responsive and gives a lot of front wheel feedback to the driver. Though steering feels a bit firm but many people likes that because it gives a more sporty feeling. In summer on dry roads, HTR Z3 would give you the performance which spirited drivers want from their drive. Also, at under $100 a piece, they are a steal. Even if you are not a spirited driver and have been using touring tires before, you should certainly try these out for an enhanced driving experience. These tires have a good steering response in wet, but it just lacks that ultimate grip. There are wide circumferential grooves to evacuate water which provides good wet traction and hydroplaning resistance. There is a possibility of oversteer when cornering at high speed on this tire in wet conditions. So, you should be more careful and don’t try to push this tire to the traction limit on the wet road. These are summer tires and should not be used in Freezing temperatures and snowy conditions. But, these tires can certainly be driven in mild winter, probably above 40 degrees, but you need to be smart about it. Since these are max performance summer tires, they need some heat to put their maximum traction and grip on the road. After 4 – 5 miles in winter these tires could have enough heat to grip better. The distance mentioned is just a rough estimate and could vary according to the temperature and road conditions. HTR Z III has a good comfort level to it. The sidewalls are not that stiff and do a good job at softening the edges of sharp bumps and expansion joints. Driving experience on a highway and city is pretty smooth and balanced. You wouldn’t experience any tire vibrations at the high speed considering they are balanced properly. The noise levels are also minimal in the cabin. Sumitomo has done a good job here by broadening the tire sound which essentially disguises it. Although at high speed on a highway the road noise makes its way to the cabin and this is normal with most high performance tires. Overall the sound levels are low and not something that would bother the driver and passengers. Tire Rack compared the above mentioned summer tires in their 0.3 mile track. According to test results, HTR Z III was the fastest with the lap time of 30.78 sec. The second best was Dunlop Sport Maxx by just over 1/10th of a second. Kumho Ecsta and Hankook Ventus followed by 3/10 and 8/10 sec difference respectively. Results show that Sumitomo clearly has a better dry handling and traction in the league of budget performance summer tires. The braking test was quite close to call. Dunlop had the shortest braking distance and Sumitomo had the longest, but the difference is very minor of only about 2 feet. Moreover, stopping distance of 86 feet is considered good and above acceptable standards. Sport Maxx TT recorded the best time in wet track testing. Sumitomo was the second best followed by Kumho LE Sport and Hankook Evo K110 respectively. Dunlop’s Sport Maxx TT clearly has better traction and cornering stability in wet conditions. Z3, as discussed above, is good in wet conditions but doesn’t really match the grip that Sport Maxx TT provides. In Braking Sumitomo again had the longest braking distance with a difference of about 4 feet. Again, the wet braking distance of ZIII is still considered good by industry standards. Is it worth spending about $300+ more on Michelin’s premium summer tires instead of budget tire like ZIII? The answer is it depends, and here are the few important pointers for you to decide. Horsepower: If you are driving a less than 500 hp car like Mustang, ZIII can surely give you the same performance as Super Sport. And, it would be more comfortable and less noisy. The difference would be seen in supercars where tires need more grip, handling and cornering stability. So, in cars like Ferrari, Z06 Pilot Super Sport will give you much better performance than Z III. Track Days: HTR ZIII is designed for street performance with comfort, wet traction in mind. It is not a track day tire. If you take your Porche with Z3 tires to the track, you would surely be disappointed. Super Sport or Pilot Sport 4s, on the other hand, can give you really good performance on the track as well. They are designed for ultimate performance. Tread Life: Michelin’s high performance tires excel in about everything. Both Super Sport & Sport 4s tires have good tread life with 45,000 mileage warranty. Whereas, Z3 could give you around 30,000 miles without any warranty. Sumitomo claims that extra ribbing on ZIII reduces the irregular wear of the tire. 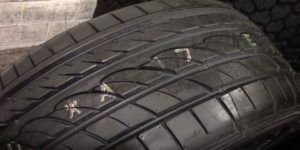 Most of the consumers have reported a tread life of about 25K – 35K miles. The tread life is not bad considering the price point and performance of this tire. Tire life also depends on the driving style, conditions and the car itself. But to enhance the life of the tires, you should rotate them regularly and check for any irregular wear. Sumitomo doesn’t provide any mileage warranty but there is a standard 6 year workmanship warranty.